Falcon maintains self shipping capabilities as well as established shipping partners which facilitate on-time and well coordinated deliveries. 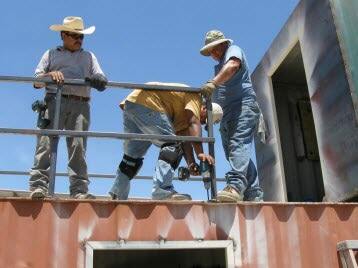 Falcon also has a setup crew that can efficiently and safely setup container structures at the customers' location. Falcon stockpiles Shipping Containers at its 51 Acre Texas facility located in Austin for quick response. Falcon self performs all of our manufacturing and fabrication, providing the customer with a low cost solution with high quality control systems. Falcon has the ability to serve locations in the Continental United States as well as Outside the Continental United States.